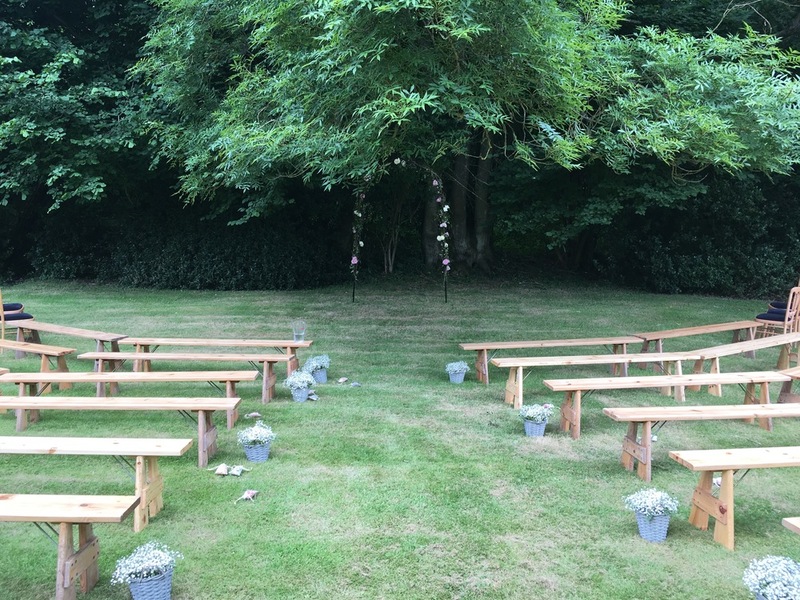 A stunning wedding at Bourne End Church followed by a marquee reception at home. Here's some gorgeous photos taken by the talented Natalie at NatalieJweddings.co.uk. I loved working with you Georgie! Petula and Ken - Congratulations to you both! A fabulous wedding held at Shendish Manor in September. Thank you both for letting me be part of your special day. An amazing weekend at BFA Fleurex 2016. Here's my first ever competition piece. I learnt so much and had good feedback from the judges, so despite being a total wreck of nerves beforehand and up at 5am to finish it in my hotel room, with really bad lighting, onwards and upwards next time! (The spec was for a "fantasy" parasol for a child). I took my "fantasy" to be an Enchanted Forest! A huge congratulations to Nikki and Mike who were married on Saturday at Berkhamsted Chapel and afterwards at Haresfoot in a marquee. Another lovely family to work with, and I hope you like the designs. Today I would like to share my news! I am one very proud florist!!! I am now a Master of Floristry! All the endless studying has paid off! I'm really looking forward to using my knowledge to continue creating designs for which I am truly passionate. Wow, the most relaxed wedding I have done to date. A tepee in the garden with a rose arch for the ceremony and plenty of English garden flowers to compliment the theme. A huge thank you to the Sully family for making my job so rewarding. I'm not sure where the past few months have gone, but it has certainly been a very busy time. I have finally finished my Master's, and am just waiting on my Practical Exam results, which hopefully will be in just as my daughter receives her A level results! Apart from studying tirelessly for three months, I have managed to squeeze in a few weddings too. If you are looking to get married next year, have a look at my face book page too, for lots more images of my work. Enjoy the rest of the summer and more news to follow very soon. The end of my Master's is almost in sight. The theory exam is done, the assignments finished, with only my portfolio to go, and a horrible plant identification exam looming next week. My head is spinning with latin names! The calendar is filling up fast with weddings, and I am trying to find some dates to fit in a few workshops. Do let me know if you are interested. I am also thinking of running "hen party" workshops, whereby you come as a group of friends, have some fun creating a design of your choice, with lunch in the garden and some fizz too. These can be booked at a date of your choice. CRESSIDA & JONNY - A PERFECT MATCH! A truly wonderful day and wow what a wedding. I was so lucky to be part of Jonny and Cressida's special day. It really is an honour and privilidge when you create the wedding flowers for friends that you have known for so long! Here are a few pictures of their special day. It's not too late to order bouquets, posies, pre-arranged vases, floral buckets of arranged flowers, galvanised containers, and much more. There's plenty of flowers in the studio, so give me a call if you would like to place an order. Have a lovely Mother's Day, whatever you are doing. DON'T FORGET TO ORDER YOUR FLOWERS FOR MOTHER'S DAY. GIVE ME A CALL IF YOU WOULD LIKE TO DISCUSS YOUR ORDER. Wow, what an amazing wedding! A beautiful marquee in the garden, on the windiest day of the year, but nothing deterred Katie and Peter from having an amazing day! Here are some photos of their wedding flowers. I can't believe it has been so long, since I last posted anything on my blog. Well I can actually, as I have been so busy studying for my Master's, only 4 months to go! Christmas was frantic with orders, decorating houses, and I completed two weddings the week of Christmas! At last I can catch my breath before the wedding season starts again next week. My two weddings before Christmas were so rewarding, and in particular I must thank the Archer family for making me feel so involved in their big day for Lucy and Will. It's colour all the way with these amazing sunflowers! Sweet avalanche roses, rosemary, phlox, wax, astrantia and green bell make up this gorgeous natural bouquet. David Austin roses, sweet avalanche roses, orchids, and white hydrangeas complimented my beautiful bride!